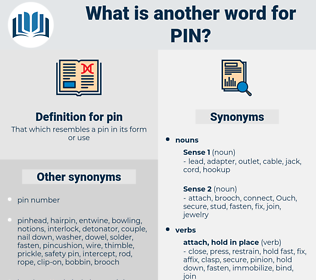 What is another word for pin? crosses, clip, ankle, badge, insignia, talon, stems, fastener. spindle, needle, brooch, prong, nip. detach, loosen, let go, loose, release, unfasten, disjoin, Unlatch, unpin. D'yer want to buy a diamond pin cheap? Moreover, so great was the silence in the room, save for the voice of the king, that one could have heard a pin drop. 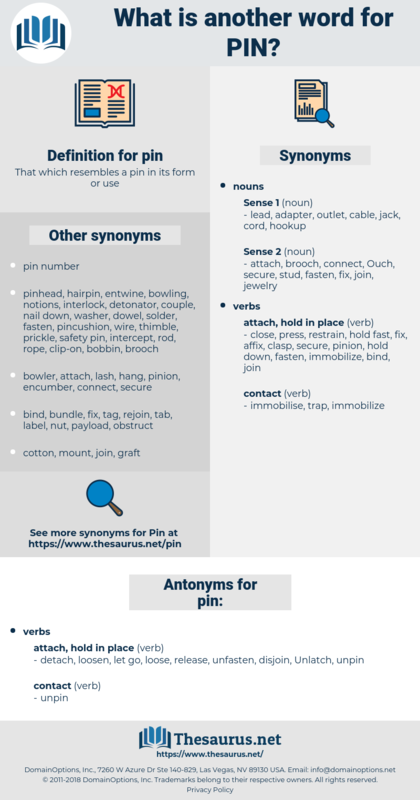 broach, hatpin, barrette, breastpin, nog, peg, rivet, wrist pin, bitt pin, tie tack, scarfpin, scatter pin, safety pin, hairpin, tiepin, linchpin, stickpin, skewer, gudgeon pin, brooch, lynchpin, straight pin. fastening, holdfast, fastener, jewellery, jewelry, fixing. spike, empale, transfix, fasten, secure, fix, impale. pinhead, stem, point, head, shank.